Algoma Country Tourism and Thunder Bay Tourism are thrilled to announce that the Ride Lake Superior website is now complete. This is one of North America’s must do routes, and is ready for motorcycle enthusiasts to begin their epic ride. This website has been create to help you plan a trip of a lifetime for you and your best friends. Ride Lake Superior is a truly bi-national ride. Offering seven great touring routes around Lake Superior, riders will find themselves traveling through Ontario, Minnesota, Wisconsin and Michigan. With stunning views, rugged shoreline, twisty roads and great motorcycle friendly attractions, Ride Lake Superior is definitely a ride to put on your bucket list. Attractions, accommodations, restaurants and repair shops have been handpicked to ensure your needs as a rider are met. Ride Lake Superior also offers many great downloadable items that will enhance your ride. Maps are available for your Garmin GPS and a Ride Lake Superior iTunes playlist has been created with classics for you to crank while you’re riding along the shoreline. Ready made itineraries have also been created with the must see locations so you can just hop on your bike and go. However, if you prefer planning your own trip, Google route maps makes it easier for you to determine what stops to make. To get you started and to make your first visit to the website as smooth as possible, we have put together a quick overview of the website with all the key spots to visit. But first, sit back and watch this video to get you pumped for planning your epic ride! On your first visit to www.ridelakesuperior.com remember to add the page to your bookmarks for easy access. 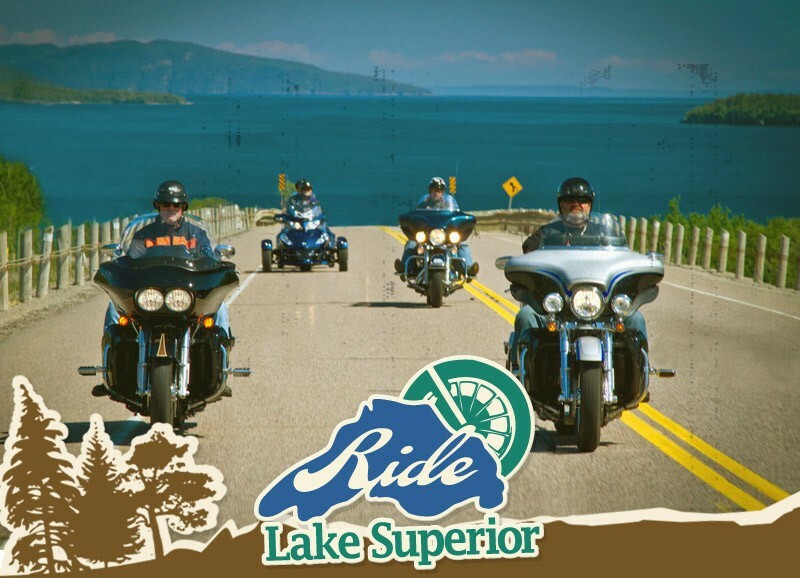 The Ride Lake Superior website has many itineraries for you to choose from. Simply click on the PLAN MY RIDE tab at the top of the page to get started. Here you will have the option to pick what route you would like to take. Once you’ve decided and clicked on the region and loop you would like to do, you will be taken to a page where you can plan your itinerary. Here you have the option of using a pre-made itinerary or building your own route. When choosing a pre-made itinerary, you get to pick your starting point in a drop down menu and an itinerary will be built just for you. For those of you who prefer building your own customizable route, this page also offers suggestions of Accommodations, Food, Repair and Attractions. By clicking on any of these links you will be given a list of all the motorcycle friendly locations along the route to help you choose where to stay, eat and stop along the way. We’ve also taken all the routes, selected places that are unique and not to be missed and put them into one condensed MUST SEE list. This is your trip, so choose what interests you. There’s nothing like cranking the tunes as you ride. We have assembled the official Ride Lake Superior iTunes Ridelist to enhance your tour around the lake. You can download any number of these classics to your device. (iTunes fees apply). We hope this quick introduction to the Ride Lake Superior was helpful and has created excitement in planning your summer tour. I do this solo trip every year on my Streetglide and just love it all. The loop via hwy 17 Sudbury to Thunder Bay then Thunder Bay to Sudbury via Hwy 11. All riders must do this. Going again next week. Because I can!! Hi all, here every person is sharing these know-how, therefore it’s pleasant to read this blog, and I used to visit this web site all the time.